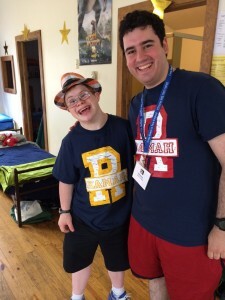 “Having kids with disabilities is just as normal as having sports at Camp Ramah. It’s what we do,” said Howard Blas, director of the Tikvah Program at Camp Ramah. That is great news for 18-year old Uriel Levitt of Silver Spring, who has Down syndrome, a genetic condition in which a person has 47 chromosomes instead of the usual 46. This summer will be his fourth one at the camp. “He’s got this amazing opportunity for growth and independence. He’s away from home for two months,” said his mother, Dina Levitt. “All year long he talk about Camp Ramah. Often, we can’t find his underwear. He’s packed it. Every now and then we have to go and unpack his duffle back,” Dina Levitt said. When at camp, her son lives in a bunk with other teens to 21-year-olds who are in the Tikvah Program and spends his day engaged in regular camp activities, often with his bunkmates but also with the rest of the campers as well. The Hebrew word tikvah means hope. The entire camp eats together and celebrates Shabbat as a group. Uriel Levitt also enjoys singing and dancing rehearsals with everyone involved in the camp play, his mother said. Uriel Levitt also learns responsibility and vocational skills. Two summers ago, he worked at the lake helping the youngest campers learn to swim. “They apparently loved him,” his mother said. Last summer, he helped out in the art room two or three days a week. Josh Sachs, 21, of Rockville, also attends the Tikvah Program. He has been enjoying his summers at the camp for more than five years. Sachs also has Down syndrome. By enabling Sachs to be involved in Ramah’s daily life and work in the kitchen performing repetitive skills, the camp is providing the training to help the young man get a job, Blas explained. Camp as a whole, but his kitchen work in particular, has “been a great experience” for Sachs, said his father, Steven Sachs. “His maturity and his ability to stay on task” has greatly improved. The young man also has grown through his positive experiences in Temple Beth Ami’s special needs program and his current work at MOST, the Jewish Foundation for Group Homes’ Meaningful Opportunities for Successful Transitions program. There he is learning employment and social skills, his father said. Not only do children with special needs have a true camping experience, but they also help other campers they interact with gain a sensitivity toward anyone who is different than them, Blas said.